Four pop up restaurants at Eq Tower until April. Interchanging vendors, app-powered ordering. HWKR is a hawker food centre inspired by the food culture in Singapore and Malaysia with a bit of a modern twist. Grab a table, order from from the counter (card only), grab your tissue and cutlery and be served by the waiters and waitresses when the food arrives. It’s close to the heart of Melbourne at A’Beckett street. Lemon lime betters is one of the best ones I’ve had. So hard to believe! All the components were perfect in quantity, it wasn’t super sweet, I reckon the lemonade is slightly different to all other bars and restaurants! Ox tongue was delicious. I have never had OX tongue, beef fat, chives and lime before and it was made tender and easy to bite. The salt was spread unevenly, but that was not a big deal. We really enjoyed it! The pork belly was at room temperature when it arrived at our table. Now sure it was pre-made as it did arrive first out of all dishes. The pear is great inside with cubed pears but the outer layer I believe is white chocolate and is not sweet – no flavour rather. It’s also filler with white cream but I’m not sure what cream it is as it was also tasteless. I know KOI likes to do light sweet, but this was a bit too light for my tasting. Will continue to try other desserts! the best flavours combined, I would keep eating it, however portion was smaller than expected. Loved the earl grey combination with yuzu coated over the strawberry. Just the right amount of yuzu and a punch of lychee. The crumbs created the textures in every bite but wasn’t too sweet. Extremely honoured to be able to take a selfie with Reynold. 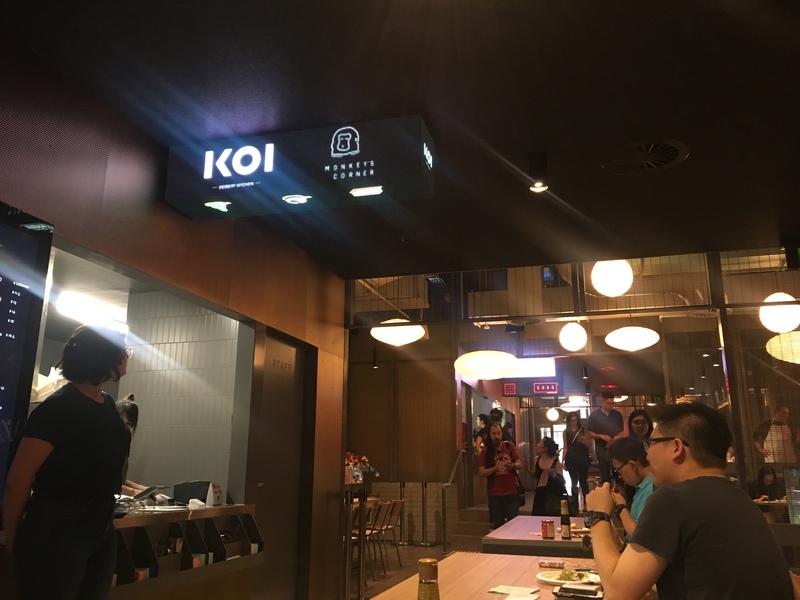 With his smart creations, I’m impressed on his bigger dishes so I will definitely visit KOI dessert bar when I go to Sydney! Will also try Chanteen’s other “coming soon” dishes at HWKR.